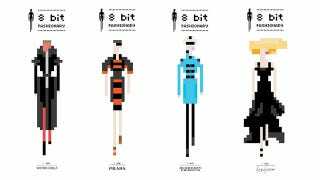 The fashionistas at fashion site Fashionary have come up with a range of 8-bit fashions based on their favourite designs from their favourite fashion designers. Fashion. Fashion. Some of those included are Alexander McQueen, Givenchy, Gucci, Prada, Yves Saint Laurent and Louis Vuitton. All iconic designs, now pared down to something you'd see in Swords & Sworcery & Skinny Women. If the thought of recreating your own 8-bit fashion parade is just too much, darling, you can buy these prints for $10 a pop.